One of the top comedians in the world! 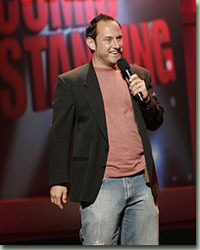 He has appeared on over 40 TV shows as a comedian. He was a cast member on season 5 of the NBC show Last Comic Standing. He holds the record for winning the most B.E.T. Comedy awards. Dante performs to sold out crowds all over the world 40 weeks a year. He has also performed for more US troops than any other comedian except Bob Hope. As an actor, Dante has appeared in over 20 films and TV shows. He has been in many commercials and was the spokesman for Miller Beer. He had his own sitcom on B.E.T. called The Blackberry Inn. Dante wrote, directed and produced multiple films. Dante was a writer for Joan Rivers on the hit E! TV show Fashion Police. He also writes, directs and produces many commercials. He owns GOLDEN ARTISTS ENTERTAINMENT. They make movies and TV shows, book live acts and manage talent. Dante is a personal manager with many household name clients. Here is my IMDB page! Please leave comments! BWH Trailer v7 from Justin Jones on Vimeo.